Is Par Good or Bad? While the Highlands/Cashiers area real estate market is coming back into its busy season, statistics show the market as status-quo. 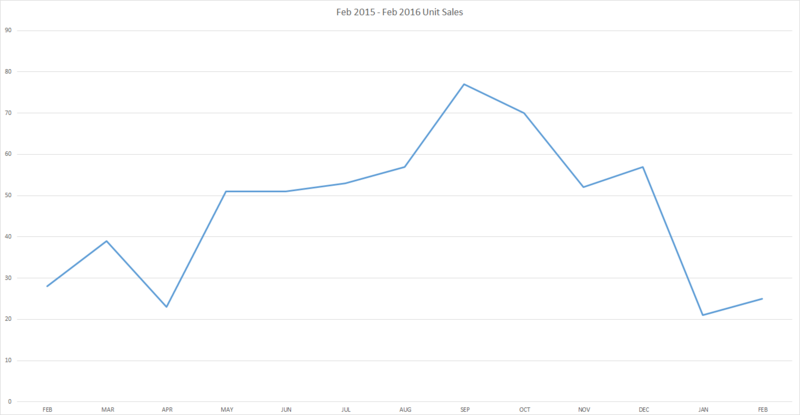 In layering the sales data from 2014 until March of 2016, we see no major changes in the market. In fact, we see 2016 starting a little slower than 2015. What does this mean? For Buyers, this is still a great time to buy a home in the mountains. It also means that buyers are in the drivers seat. For Sellers, it means that expectations to sell their home should not be set too high. High expectations can result in homes staying on the market for longer periods of time (DOM or Days On Market). Market Outlook for Real Estate – Click for LARGER IMAGE. HOW CAN I GET MY HOME SOLD? Be reasonable. Look at the chart below. 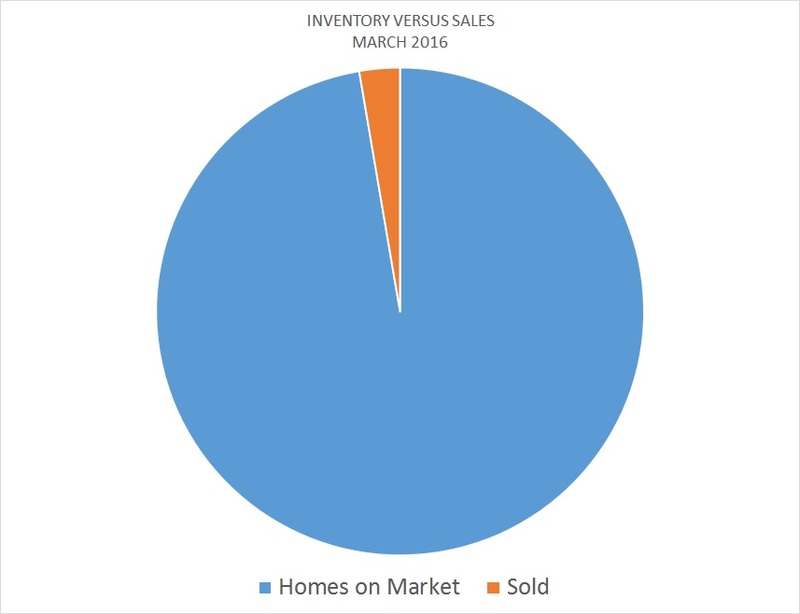 This shows the number of homes sold in March 2016 as compared to the inventory available. You might say, the blue area is your competition. Now realize that the ORANGE SLIVER represents the 32 homes that did sell. So, divide the ORANGE SLIVER into 32 equal pieces. That one small section you end up with of the 32 is equal to your home. So, how do you compete? How do you plan to get your home sold? Believe it or not, your Broker wants the same thing you do; To sell your home for the most money they can get. However, your Broker is in the best position to tell you what the Market is doing. They watch the Market continually to offer you advise. While it is true you may “feel” your property is worth more or that you may have paid more for it or put a lot improvements into it, COST ≠ VALUE (Cost does not equal Value). After many Days On Market (DOM) Sellers were forced to reduce their prices to get their homes sold. The mentality of many is, “The buyers are going to beat us up on price, so we’re going to price high so we can give a little,” is not a good strategy. Why not? If you are overpriced, buyers are not going to look at your property. They will go look at properties that are closer to their budget. For example, if you’re priced at $495,000, buyers looking in the $400,000 – $450,000 range may never see your listing. If your home is not “In the Market” for what they are looking for, you are overpriced. The competition for the Market is tough and you have to be priced right to sell. Buyers know the market and they simple will not consider properties that are priced to high. If you’re not getting many views on your home, chances are good you are priced too high. If you want your home sold during this upcoming selling season, you need to develop a strategy now. Total homes listed in Highlands/Cashiers MLS: 1159 – This number is expected to rise as many Sellers desire to take advantage of the selling season. This number is expected to rise to around 1500. 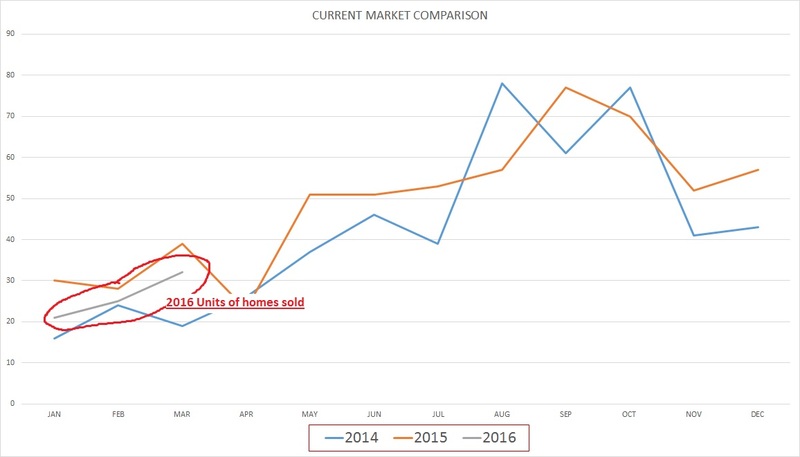 Homes Sold This Month: 32-Less than the 2015 model, as seen in chart at top. Inventory: 24 months – This is determined using the Average Sales Per Month, as this market is very seasonal. Remember, a healthy market inventory is considered to be 6 months or less. Median Sales Price: $243,500– This is a more significant number than “Average Selling Price.” This helps us to see where the middle of the market is selling. Average List/Sell Ratio: 90.03% -Take into consideration this is not the “Original” List Price, as mentioned earlier. This continues to show that homes are overpriced. Sellers need to be aggressive in pricing to stir competition for their home. Pricing aggressively is what creates more lookers and more offers. Synopsis: As we are coming into our Selling Season, Sellers should want to take advantage and be aggressive. As we go further into the season, if there is a lack of lookers, Sellers should want to consider their pricing and adjust accordingly before the season wanes. Total listed in all MLS: 1188-This number should continue to increase, which is not good for Sellers. Inventory: 84 months. That’s 7 years of inventory. Some sellers have given their land away if the buyer covered the closing fee’s. Land is moving, but there is no real demand. Synopsis: No demand means prices for land remain very low, compared to former pricing. 31% of home sales ranged from $200,000 to $499,999. This is the major portion of market sales. 15% of home sales ranged from $500,000 – $749,999. This was a significant rise in homes in this price range. 12% of sales were above $1,000,000. Unchanged. Sellers, you should not expect top dollar for your home. If this is what you desire, you may want to remove your home from the market, temporarily. Buyers, as we head into our busy season, good buys don’t last long. You need to be on top of any listings that pique your interest and be ready to move on them. February is typically one of the slower months in real estate sales for the Highlands/Cashiers area. This February proved to follow the yearly real estate trend. However, this February was a decline from 2015. Still, when looking at the data from the Year Over Year (YOY) numbers, we should start to see an increase in sales as we head into the 2016 “Selling Season.” Indicators, such as the number of people that have been showing up in town, are impressive. If you are looking to sell your home during the 2016 “Selling Season” you may want to discuss your options to improve your chances of selling. Pricing is everything. The buyers still appear to be in control of this market. Many brokers are still trying to get at or near assessed values of properties. However, that strategy may not be what works best for you. The following chart shows where homes have been listed (orange block), where homes have actually sold or closed (gray block) and where the homes were assessed (yellow block). Pricing is Everything! CLICK FOR LARGER IMAGE. Sellers need to be realistic in the pricing of their home. Pricing your home higher than what the market allows means your home will probably just stay on the market. Buyers know the market and are not willing to pay more just because that’s what the Seller would like to get. A good broker is not one that tells you what you may want to hear. A good broker is one that shows you what the market is doing and gives you information so you can make an informed decision. Total homes listed in Highlands/Cashiers MLS: 1134 – Expect this number to rise in the coming months. Inventory: 24 months – This is determined using the Average Sales Per Month, as this market is very seasonal. This number continues to be in excess of what is considered a “healthy” market. DOM: 483 – This number will remain high until inventory is reduced..
Average DOM (YOY): 467 – This is the yearly average for DOM. Homes are selling, but not as fast as they are being replaced. Median Sales Price: $200,000– This was a significant drop in price. This is what we may consider to be the “sweet spot” of the market. Homes around this number typically have a better rate of selling. Average List/Sell Ratio: 88.41% -This is another indicator that homes are still considered as overpriced. If you are serious about selling your home, talk to your broker. Many feel that since people want a bargain, they are going to ask for a lower price. However, people that are already priced well stand to gain the sell of their homes. Synopsis: We have a narrow selling season. One should not go into the season only to miss out and have their homes listed another year. Price right to take advantage of getting your home sold this season. Do not wait to see what the market will do, It may be too late. Have an aggressive strategy, if you want to see your home sold. 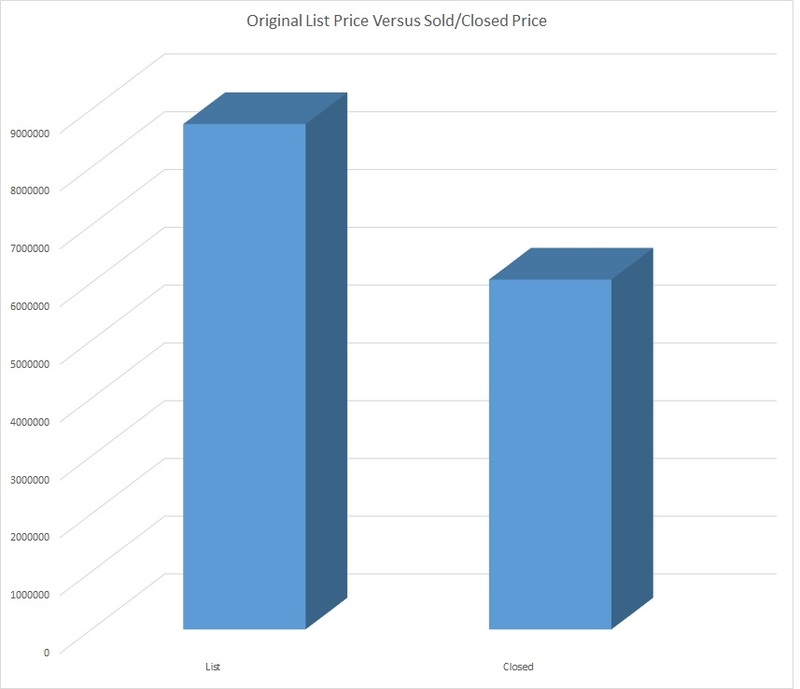 Land Units Sold: 14 – This is a 100% increase in land sales!!! Still, keep things in perspective. It’s only 14 unit sales in all of the MLS with over 200 brokers. That is, approximately only 1 in 15 brokers sold any land during the month. Not really good odds for land sales. Inventory: 80 months. That’s 6.5 years of inventory. Are you willing to wait that long for your property to sell? Synopsis: There is no real demand for land. The market is driven by ‘Supply and Demand.” If there is no demand, there is very little perceived value, regardless of tax assessment, etc. Remember, tax assessment is for county revenue. 52% of home sales ranged from $200,000 to $499,999. 8% of home sales ranged from $500,000 – $749,999. 12% of sales were above $1,000,000. This was good news for higher end home sales. Buyers, be prepared to take advantage of any deals offered. Homes priced properly do not last. Make sure your broker knows what you are looking for so he can alert you to price changes and new offerings. Make sure he knows your maximum budget. You may be able to get a whole lot more without having to pay a lot more. If you’re considering listing your home for sale or purchasing a home in NC, please feel free to contact a local agent or REALTOR®. He will make a specific report for your area in our MLS (Sapphire, Norton, Glenville, Highlands, Toxaway, Clear Creek, Breedlove, etc). You can then make an informed decision on how to sell or buy your home.